I lead a fast-paced life. Co-owning a business means there is always more to do and never enough time. I like riding my bike as fast as I can (and am proud that my average speed last year was my fastest year yet). I am constantly looking for gadgets that can speed up things. Having lived for nine years in NYC, I even walk fast. I also have limited patience for people going slower as they slow me down. My general mind set is that slow means wasted time. The last few years with my aging parents has been a stark contrast. Everything for them is slow. When they were both alive, they walked slowly together. 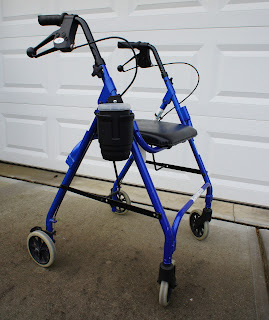 Now, after my dad’s death and my mom’s stroke, she uses a walker and moves even more slowly. My natural tendency is to walk too fast. That makes her feel bad, of course. “I’m sorry I’m slowing you down, Barry.” (My parents called me Barry to distinguish me from my dad, Billy, and my grandfather, Bill. I ditched the name Barry as soon as I got to school. My mom will always call me Barry and I am fine with that.) I have to force myself to slow down and not appear impatient. The picture at right is of my mom's Rollator. To me, it looks like a walker. I jokingly call it her stroller because strolling is her pace, at best. She insists, however, that it is a Rollator because it has four wheels rather than the two on a walker. As you can see by the cup holder, the elderly become quite attached to their Rollators and customize them with all manner of decorations and enhancements. My mom even speaks slowly. She is as sharp mentally as she ever was, but she takes her time in speaking. If you ask her a question, the answer takes time. Not only does the first word take what seems like an eternity to come out, but she takes quite a few words before she gets around to the answer. “Did you eat your breakfast today?” Pause. Pause. “The woman who brought the breakfast gave me orange juice that was frozen solid. I’m still waiting for them to get me new orange juice.” The response goes on. I struggle to not check email on my iPhone. I've started reading a book, A Bittersweet Season: Caring for Our Aging Parents--and Ourselves by Jane Gross, to try and better understand how to deal with an aging parent. The book is good, but it is obvious that I have much to learn and change. Fundamentally, I have issues with slow. I realize most of what I’ve just written does not portray me in a particularly favorable light. My goal, however, is to honestly examine the rush in my life in light of my circumstances and what Scripture has to say. While going fast helps me accomplish things, my time with my mom has convinced me I need to better embrace slow. Psalm 46:10 is often translated as “Be still and know that I am God.” Other translations start the verse out with “Cease striving” or even “Let go, relax.” The whole Psalm is one of reassurance in times of trouble. It starts out with “Our God is our refuge and strength, a very present help in trouble.” The writer of that Psalm understood the value of slow. I don’t think that the answer to everything is to go slow, but I must make space for slowness. One of the books I’m currently reading is 24/6: A Prescription for a Healthier, Happier Life by Matthew Sleeth. In it, he stresses the importance of a Sabbath day. The author (a doctor and the husband of the author of Almost Amish) argues that we were made with a need for rest. While we should slow down more than one day a week, the weekly cadence of a slow day is an important discipline. Over the coming weeks, months, and years I expect to continue to go fast. But, I need to try harder to make more room for going slow. I need to learn to mosey/stroll/amble with my mom. I need to be less impatient with her slow responses. I guess my mother still has more to teach me, even if I am slow to learn. I resemble your remarks! Thanks for writing and causing me to ponder my own common situation and reminding me that my "slow" mom is also still teaching me !